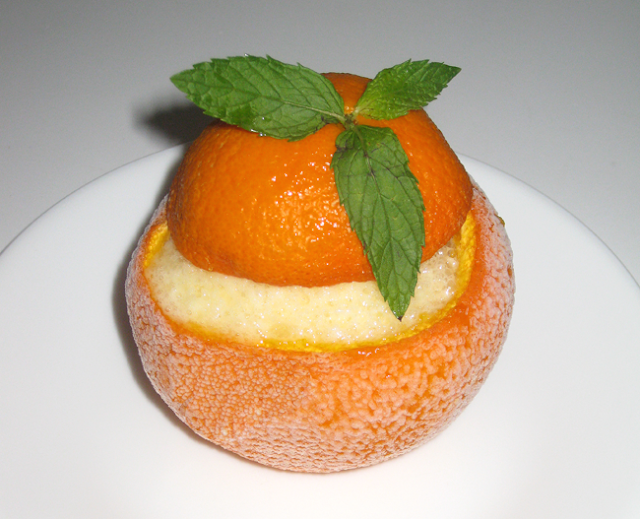 This dessert would be best compared to orange sorbet or sherbet (if eggs &/or other dairy products are added), except that it is served in a hollowed out orange shell. There are many different variations, but most consist of an orange, lemon juice, a sweetener of some kind (usually sugar), & sometimes also a meringue (egg whites) &/or a dairy product like crème fraîche, condensed milk, or yoghurt. There are also versions with additional ingredients like vanilla sugar, &/or orange-flavored liqueur, or some combination thereof. Light and sweet, orange givrée will cleanse the palate between courses or provide the perfect finish to a meal. Directions: Cut off the tops (about 3/4") of four navel oranges & completely scoop out all the flesh with a grapefruit spoon. Scrape each orange clean until you reach the pith (white part) of the orange, being very careful not to tear the hulls as you hollow them out. (It helps to scoop a little cone out from the middle and then expand/work your way out from the center.) Using a toothpick, poke a hole through the top of each orange "hat," i.e., where the stem was once attached. Put the shells and the "hats" you just created into the freezer. (They can be frozen for a few days if the sorbet isn't served on the same day). Either squeeze the extracted pulp with your hands or put the pulp into a blender to extract the juice & pulse until pulp has been broken up into little bits. Then strain pulp through a sieve, collecting the juice in a blender. Measure the juice: You'll need to produce about 1 c. of juice per orange, or 4 cups total. If there is less, supplement with orange juice to make 4 cups. Pour lemon juice and honey into a sauce pot, and bring to a boil. Turn down heat to medium, stirring continually with a wooden (or heat-proof) spoon, and simmer until honey has completely dissolved and the mixture forms a syrup, about 2 minutes. Cool. To save time, you can submerge the pot in an ice bath, putting it inside a larger pot filled with ice & cold water. Then pour the syrup into the bowl containing the orange juice. Add yoghurt & mix in the blender until frothy. In an electric mixer, beat the egg whites until stiff peaks form. Transfer meringue to the blender with the juice mixture and pulse for about a minute, or until you get a very creamy, frothy consistency. Transfer to ice cube trays (or if you don't have multiple ice cube trays, use a large, deep metal tray) and freeze for a minimum of 2-3 hours. Remove sorbet from freezer. Allow frozen mixture to soften ever so slightly, for about 10 minutes or so. Using a teaspoon, scrape out sorbet from tray(s). (If sorbet is still hard, you can also add them back to the blender & pulse just a tiny bit.) Fill each (empty) orange shell with sorbet, pressing down firmly after each scoop is added. Make sure each shell is well packed with sorbet; the sorbet should overflow a bit from each shell, forming a slight dome. Place the caps back onto the tops of the orange shells and put the sherbet-filled oranges back into the freezer until you're ready to serve them. Just before serving, remove the frosted oranges from the freezer and garnish each frosted orange with mint sprigs, threading each sprig through the holes you'd created for each orange "hat." You can serve immediately or freeze for later. The frosted oranges will keep for about a week in the freezer. Yield: Makes 4 frosted oranges. Serving Suggestions: Serve with ladyfingers or macaroons. Variations: For a little kick, add a dash of vanilla, or a few splashes of orange-flavored liqueur like Cointreau, Grand Marnier, Curaçao, or triple sec into your orange juice mixture before freezing. The oranges in this recipe can also be substituted with other citrus fruits like (large) lemons or limes, or even grapefruits. However, please note that the amounts of the other ingredients in this recipe will have to be adjusted accordingly, as their tartness varies and will need to be offset with additional ingredients (like water). The water can of course be added to the lemon juice & honey during the syrup-making step.